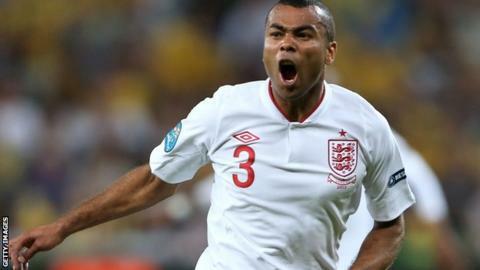 Ashley Cole says he has "unfinished business" with England and is targeting his 100th appearance for his country in the final of Euro 2012. The left-back, 31, has played in every major tournament for England for the last decade, but has never progressed beyond the quarter-finals. "There is unfinished business," Cole told BBC Sport. "I have been lucky enough to play 97 times for England and hopefully I will get 100 in the final." He continued: "I have never had the joy of winning for my country and I am not getting too far ahead of myself or the team but so far it is going well." England will first have to overcome Italy in Sunday's quarter-final in Kiev. "Cole very rarely has a bad game for England, and he has worked hard at his game down the years. On the pitch, he rarely does anything wrong. He also turns up for his country in every match, he never pulls out of squads. It would be fitting if he won his 100th cap in the final of Euro 2012." Cole, who is England's most capped full-back, was in the side that last bowed out at this stage of a European Championship in 2004, when they lost to Portugal on penalties, and he has also experienced last eight disappointment in the 2002 and 2006 World Cups. "This is my fourth quarter-final now and I have bad memories of the others, so I want to look back at those and think about what I did and what could help me for this one," he added. "It [Sunday's game] is a different game against a great team but the spirits are high and the lads are buzzing for the game, I am confident. "We know it will be a tough game on Sunday but they say dreams come true and hopefully this can be one of my dreams." The spirit throughout Roy Hodgson's side has been highly praised, and Cole insists he and his fellow team-mates are determined to give their all when on the pitch. He said: "We are like 11 bulldogs who never give up and basically will die on the pitch for each other. So far it seems to be working." For Cole, that bulldog spirit has been especially evident in his team-mate John Terry. "Steven Gerrard has become the personality and player England's squad look to here at Euro 2012 and they will do so again as they attempt to extend a satisfying tournament even further against Italy." The Chelsea centre-back put in a strong display against Ukraine in England's final Group D match, making a number of crucial interceptions and blocks to ensure Hodgson's men hung on for victory, and Cole was keen to highlight how important Terry has been for both club and country. "He has been a great servant for Chelsea and whatever has gone on in his life he has always put that to the back of his mind and done his job in a very professional way," he said. "When it comes down to it he would put his body on the line for any team and any players who he plays with and he is a joy to play with."